Two fully equipped service vans to handle PM’s and road service. 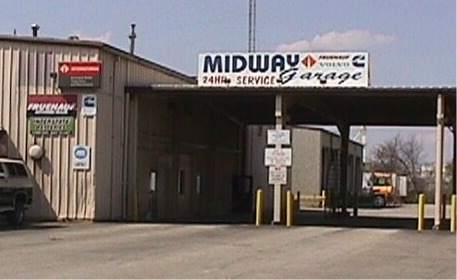 Thank you for the opportunity to introduce Midway Truck & Trailer, Inc. Midway Truck & Trailer is a full service vehicle maintenance and repair location dedicated to the trucking industry. Our trailer shop is open 24 hours a day, seven days a week. The tractor shop is open 7:30 am to 7:30pm 7 days a week. The Parts Department is open 8am to 5pm Monday thru Friday and 8am to 1pm on Saturday. We are located along state route 16 downtown Newark in front of Owens Corning. We are approximately 30 miles east of Columbus and 8 miles north of interstate 70. We employ 26 tractor and trailer technicians. Major and minor repairs on light, medium and heavy duty trucks. Pick up and delivery service available, or on-site repairs. Computer engine Diagnostics available for Cummins and Detroit. Major and minor repairs on semi-trailers, reefers, tankers, straight trucks with box vans, flat beds and car trailers. Pick up and delivery available or on site maintenance. Ask us about our custom designed maintenance programs to fit your needs. Call us for all your parts needs. We have a large inventory at Competitive Prices. Specials orders are no problem. Eliminate downtime, same day or next day parts available.